When he needed it most, Chase Brexton Health Care gave Carl Butler hope. Now, he’s spreading that message of hope on the largest canvas of his life. Carl, an artist, recently completed work on the “Mural of Hope,” a massive painting on the side of a building belonging to the Asbury United Methodist Church in downtown Frederick, Md. The mural is the culmination of an artistic life which began when Carl left his home of Brunswick, Md. to attend the Maryland Institute College of Art in the early 1980s. Shortly thereafter, he took up residence in the Mt. Vernon neighborhood, and like many members of the LGBT community, sought the welcoming, affirming support we provide. At Chase Brexton, Carl experienced the individualized, personal care that our patients have received for nearly 40 years. Our patients aren’t just names on a file—they’re unique individuals who become part of our family. Carl eventually moved back to western Maryland, and with his separation from Chase Brexton, finding a new provider who could meet his needs wasn’t easy. As he established a life back home, Carl eventually joined Asbury UMC. When the church sought to decorate the side of one of its buildings, Carl tackled the key piece—a 200 square foot mural painted onto the brick façade. Carl admits he wasn’t always sure he would finish the project, but his faith, his desire to spread the message of hope, and the encouragement of those in the neighborhood spurred him on. At one point, he said he may have even seen a sign from above—three rainbows, on a day without clouds. “Often I would pray, and I would ask, ‘Lord, paint through me,” Carl remembered. “So I’m hoping that a part of what I’m creating is perhaps what He wants folks to see. 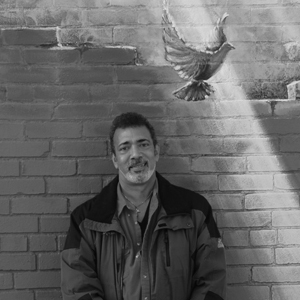 One day in early December, Carl stood across the street from his completed mural and discussed the project, when a passerby approached. The man had noticed the painting days before, and came back to take photos of it. As the passerby enthused about Carl’s work, a humble smile crossed the artist’s face. Afterward, he said the adoration gave him “chills”—and hope, similar to what he once found at Chase Brexton and displayed for all to see in his mural.